After the rest, we continue on with our journey to the summit. The weather is a big cloudy, and we might encounter rain in the evening when we descend. 12.22pm. From this point onward its all ascending, and along the way there are a few places which have small stream water flowing down. 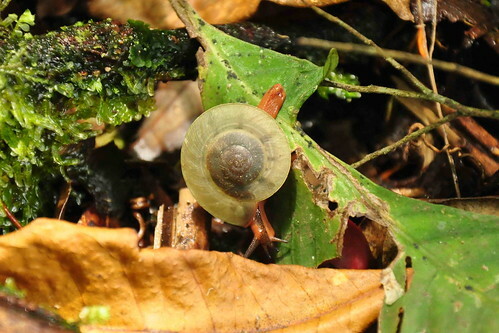 I found this very tiny snail which I nearly step on it. 12.25pm. 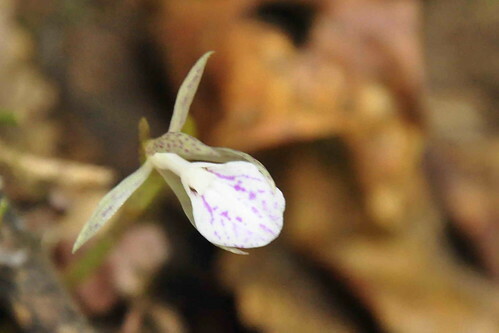 And also there are a lot of wild orchids along the way. 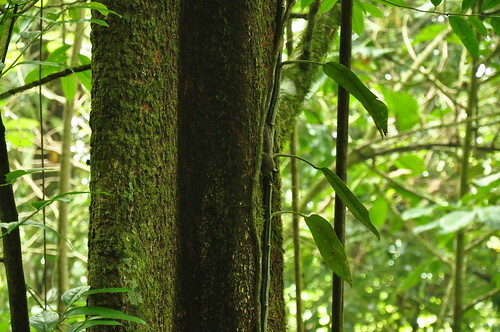 Sometime we even can find more than 10 different species of orchid on a tree trunk. Good sign, as it shows that the forest on my home land are still rich with flora...must cherish it. So along the way, whenever I saw any plastic bags, or bottle I will take it along with me, and throw it when I reach the resort. 12.45pm. Leech, live in humid/wet places. And leech is a very fragile animal, so if you ever encounter leech, it means that the place are still in a good condition. There are 4 of us, and one of my friend been bitten by leech at least 10 times. While for me, I keep on checking on my leg, if I found one, I will just pull it away. 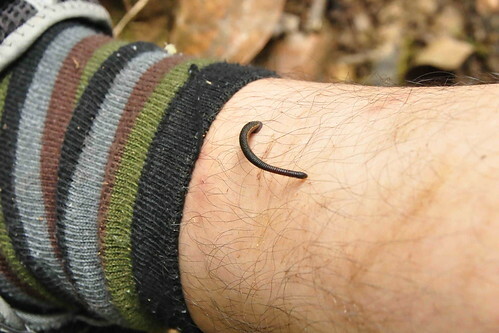 So far leech bite for today is ZERO ;) but a few time nearly got bitten like this one. 12.55pm. 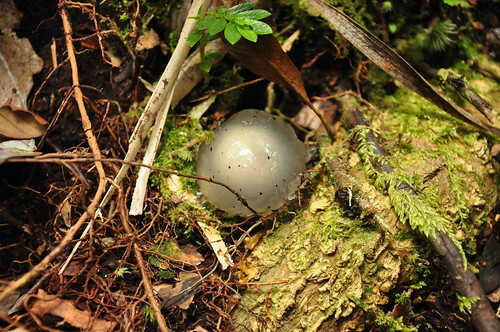 Saw a rambutan look alike mushroom. I did not disturb the mushroom, but just took a picture of it. 1.04pm. Yeah!!! the summit. We finally reach the summit, well that’s not tough. The student told us that there will be a lot of ladders to climb, but we did not see any ladders. I think they are bluffing. This is me enjoyed the view. 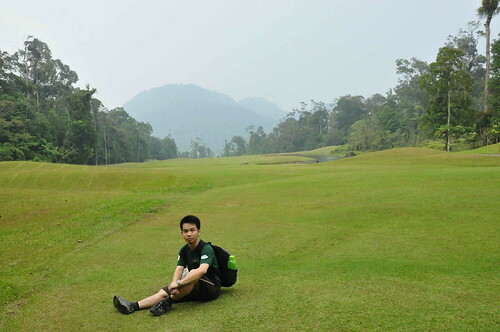 Nice, I can see the golf court from up here, but not the Kalimantan (Indonesia) border. It must be on the other site. While we’re here, we rest, and ate some food. And one of my friend got bitten by leech again, oh my... pity him. 1.21pm. 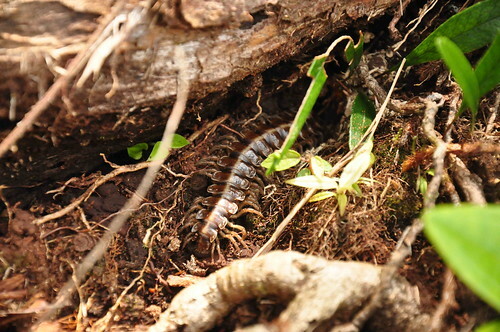 I saw one millipede, so different between a millipede and a centipedes is that millipedes have paired legs, while centipedes don't. 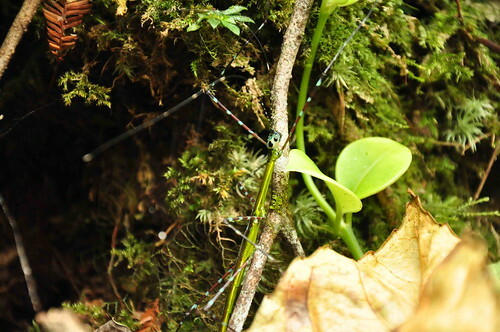 This was told by one of the insect expert from the Borneo Highland tour guide. We take our time to reach the summit, and along the way my friends stop whenever they hear the sound of birds singing. 1.55pm. There are so many ladders to climb, the ladder are made from aluminium and this is to avoid corrosion. While I was in the middle of climbing the ladder, I saw this weird looking insect right in front of me. Its body colour are well blend with the green vine in front of me, its a mantis looking creature. 2.07pm. We reach flat ground, and I can sense that we’re near to the Penrissen summit. 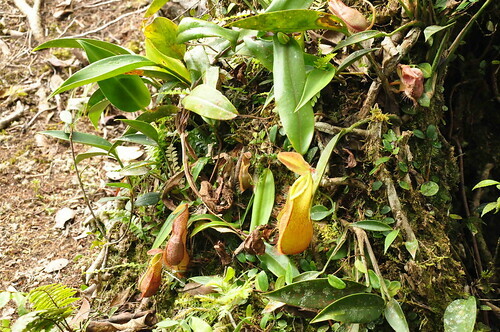 Saw this beautiful pitcher plant along the way. 2.13pm. 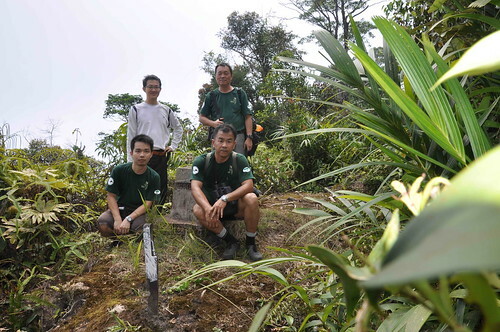 Standing L-R: Leewang, Ho Swee Ping, Front L-R: Wilson Chin (me), and Ong Fu Hong. Finally we’re here on the summit. The Penrissen Summit, and from my friend reading we’re on 4360 feet above sea level. And the stone in the middle is the border stone. 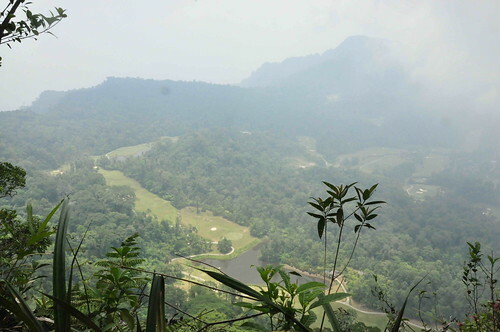 So the Kalimantan, Indonesia border is the view on the cliff side (where Leewang and I’m at), and Kuching, Sarawak is the one which face to Ho Swee Ping, and Ong Fu Hong near the trail. From the stone it also marked Republic Indonesia on one side, and Malaysia Sarawak on the other side. So there is no time to waste, we then quickly ascend before it rains. Oh ya, about the view up there, it was all covered by fog. Although I took a few pictures, but cannot see anything. 3.03pm. When going down, there are a lot of ladders to climb too, some are very steep. We just take it one steps at a time, and one of my friend even saw a hornbill while on our way down. 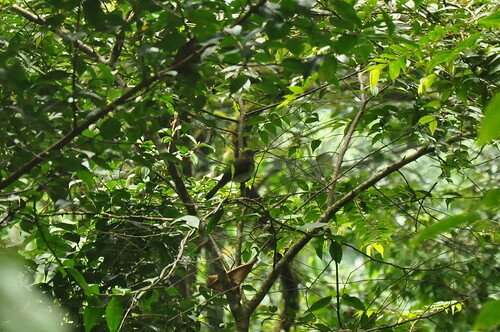 But he’s so regret that he did not capture the hornbill’s picture. Then, we saw this adorable tiny squirrel, wondering on the tree trunk. It has a fluffy tails, with white fur on its head. 3.46pm. 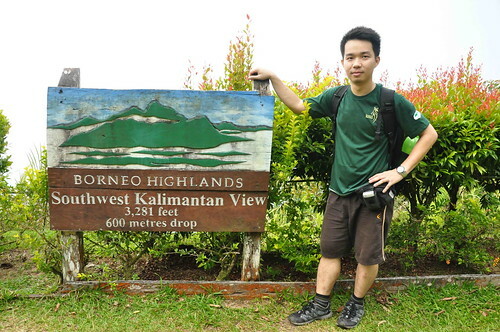 We then need to walk back to our car, where we park at the Kalimantan viewpoint. Remember this morning we skip the view point and head to the trail first, so now lets checkout how is the border looks like. Our neighbour country Kalimantan, Indonesia. So I end my post and my journey to the Borneo Highland Summit trail with this panoramic view of the Kalimantan/Sarawak border view. hi. was it a hard and dangerous trek? thanks! Hi, I would classify it as moderate. Just make sure you bring enough water, and wear normal clothing, then you should be find. Oh, and bring a friend with good sense of direction too if possible.